They're the kings, the men behind the team behind those epic John Lewis Christmas ads; the guys who rewrote the rules and made appointment-to-view TV ads cool again. They run the best agency, they've been fêted with the world's biggest gongs. So why exactly are David Golding and James Murphy going to the well again? We have to start with the money. Yes there’s "what?" and "how?" and "when?". But with a comfy £27.5m apiece in the bank, we must start with a big fat "why"? Why are the lottery-rollover rich James Murphy and David Golding rubbing down the blackboard and starting again, plotting a new launch into a destabilised advertising market at a time of financial uncertainty and political turmoil? Why build another creative agency when your last one was the most successful start-up so far this millennium and you’ve made more money than the global editor of Campaign will make in 300 years? Why risk your reputation as the superstars of 21st-century British advertising, leaders of one of the world’s most awarded agencies, role models for would-be entrepreneurs? Short answer: cut these men and they bleed advertising, they bleed it hard. Every pitch, every big new campaign, every awards show: Class A straight to the veins. Even when they had nothing left to prove and money to burn, Murphy and Golding have always loved the game far too much to just go home with their trophy and get fat. "We want fresh and exciting challenges. It’s as simple as that," Murphy says. Golding adds, with masochistic relish: "And we’d like to be scared again. We’d like to go out there and have to kill our own lunch again." This from the man who savoured the stoicism of bringing in his own sandwiches each day when Adam & Eve opened for business in the recessionary bleakness of 2008. And you sense he can’t wait to be tightening his belt again, watching the corporate pennies, even though the discipline will be born of choice not expediency next time round. So, sometime in the first half of 2020, presumably after completing their 12-month notice period next spring, and then a year’s non-compete restriction, Murphy and Golding will launch "a creative communications agency". There’s no fancy mission statement or shiny new model they’re working on yet, just an undimmed passion for advertising. "We have an unwavering belief in the power of advertising and the power of communications," Golding says. "So we’re not running away from the industry, we’re running headlong into it." Really, it was always a question of when, not whether, they’d go again. Now there are two generations of succession management in place behind them at Adam & Eve/ DDB, and enough time has passed to avoid the vulgarity of just grabbing the money and running. And in an agency market fraught with doubt and even self-loathing, they see a clear opportunity for a confidently creative communications company. And, hell, it will be FUN. Which it wasn’t always, first time around, if they’re honest. "Because of the emotional shape of those early days at Adam & Eve, in a sense we feel we had our start-up years taken from us," Murphy admits. When they left Rainey Kelly Campbell Roalfe/Y&R, where Murphy, Golding and their creative partner Ben Priest had formed the management team, accusations of soliciting Y&R clients pitched them immediately into a long, intensely bitter, scary and extremely costly legal battle with their former boss Sir Martin Sorrell. Talk about motivating influences. So this time they’re going to enjoy being new and small and hungry for a while. But don’t imagine this next agency will be some rich man’s plaything. "I don’t know how big it’s going to be," Golding says. "But I do know we’re not interested in a lifestyle business. As anyone who’s worked with us will know, we don’t have a variety of speeds. We only have one speed. Which is absolutely going for it. We won’t be playing in the margins." And one thing we can definitely expect from the new company is that Murphy and Golding will be hands-on. "Our ambition is to be absolutely on the work," Murphy insists. "At Adam & Eve the sheer momentum ran away with us: one minute you’re loving what you’re doing and the next you’re having to do more management than thinking and making. We want to do the thinking and making again." OK, so you’re launching a creative agency. But where’s the schtik? Golding explains: "When we started out with Adam & Eve we did say we don’t want to be different. We just want to be good. Nothing has radically changed in that respect. We don’t want to be different for the sake of it. We just want to be really, really good. And the truth is to be really, really good today, you need to have a brilliant, powerful creative idea, and then the ability to execute that through the customer journey through all the fantastic new technologies that are now available. It’s as simple as that." So the new agency will definitely echo the old. But have the founders changed much in 10 years? Yes, Golding insists. "We have significantly more confidence now about the power of creativity to change business because we’ve seen it time and time and time again across many different categories. When holding companies now say creative agencies aren’t delivering, it’s because their creative agencies aren’t delivering. I haven’t yet met a client who says: ‘Forget it! It’s all in-house. What we don’t want is any top-end creativity or top-end brand thinking. No place for that in my brand.’ There’s an awful lot of clients who want agencies with more creative flair." So I’m hearing loud and clear: creativity, creativity, creativity. But hang on. Murphy’s a suit, Golding’s a planner. There’s something missing here, huh? A great big Ben Priest-shaped hole. "Erm, we have a number of thoughts in that direction but nothing concrete yet," Murphy says. Oh go on, off the record, what thoughts? "Not even off the record" – except that we spend the next 10 minutes throwing around names. The real issue, though, is finding a creative partner who can join them as an equal. Who can slip in alongside these hugely successful, financially secure blood brothers? "Well, they won’t need to put money in," Murphy says. "When we launched Adam & Eve we never took a penny of investment and we never borrowed a penny. So we won’t be saying ‘you have to have lots of money to invest in the agency if you want to join our gang’." And the chemistry isn’t that hard to find, Golding insists. "Since we knew Ben was going and there’s been a change of the creative guard at Adam & Eve, we’ve worked with lots of creatives and the chemistry with them is as good and open and trusting and honest as it is with the two of us. One of the biggest changes in the last 10 years is that our respect for creative people is now sky high. So I don’t think someone coming in is going to find the chemistry particularly difficult frankly." Mind you, they’re not entirely sure whether the idea of working with them will be a draw or the opposite. "I wondered that," Murphy admits. "I’ve no idea which way that cuts." 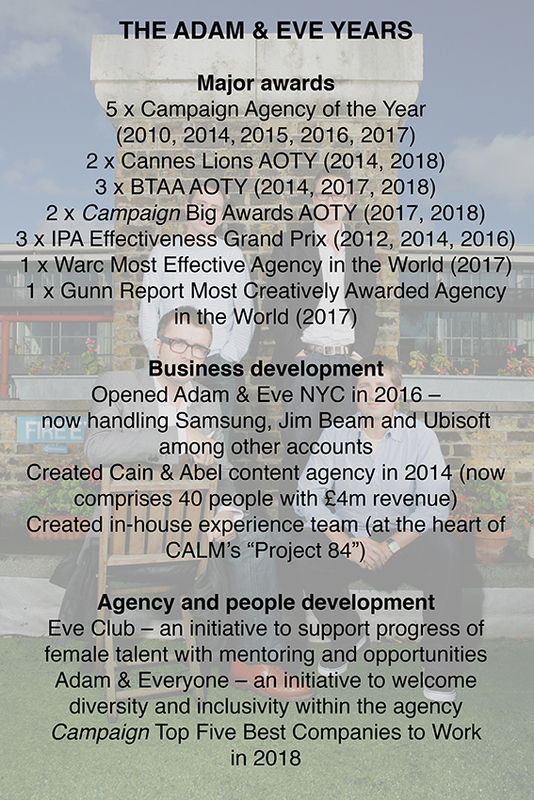 Of course, creative agency 2020 will have a different make-up from the original Adam & Eve but creativity will still be the heartbeat. 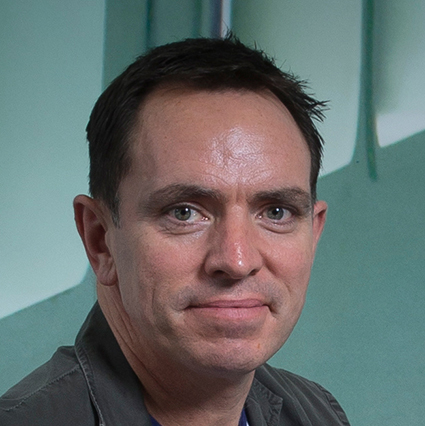 "We’re certainly not about a rejection of things like programmatic, data or performance marketing," Murphy insists. "But the idea that they replace creativity and inspiration around brands and what they stand for is ludicrous; within the very nature of performancebased marketing it optimises itself across every brand until it becomes the new floor. So we will be about how you stand apart and create competitive advantage through brilliant insights and brilliant creativity, building brands that are memorable and valued by human beings." Golding warms to the theme: "Everyone’s got these charts now that say there are two strata of communications that we need: we need brand and strategy, and then we need in-house, mass volume delivery. All that’s happening is that clients are taking the second bit, the below-the-line bit – which is now digital optimisation – in-house. And that’s very sensible. But no client’s saying ‘what I don’t ever want is the strategy and the creative and the bits that are really important to my brand’." "Yet everyone else appears to be running away from being a creative business in our market," according to Murphy. "I think people need to run towards that, and now seems like a very good time to do it. There’s been a collective loss of nerve; instead of adding to their core competency of creativity and strategy, agencies have lost confidence in that core. 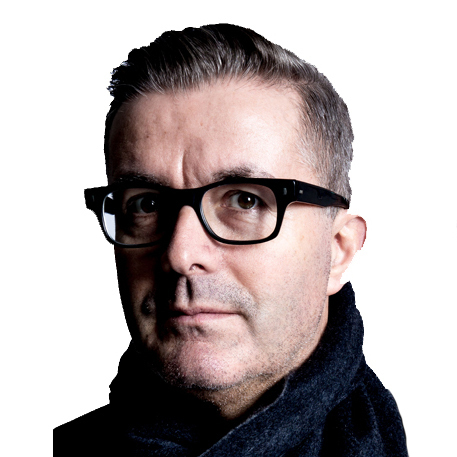 It’s time for people to rally round what creative agencies can actually do. "If you’re a marketer pursuing a programmatic, performance-led strategy, you can say to your board I spent £1m and I got £1.5m back. But the board should be looking at the marketing team and going: ‘OK, why didn’t you turn £1m into £12m. Or £15m? Because that’s what we understand marketing can do.’ And that’s the question that’s not being asked enough: how do you create a real multiplier? How do you create marketing that’s at its most effective, not just at its safest and most predictable?" The first act, Rainey Kelly, was great. Adam & Eve has been successful beyond our wildest dreams but the third, how will that go? That's the scary part. My children are not going to be in penury. But at the same time, will I look back and go ‘It’s been three amazing eras'? They’re pretty clear about where other agencies are getting it wrong: too much hierarchy, too many silos breeding paralysis, atrophy, politics, lack of inspiration. 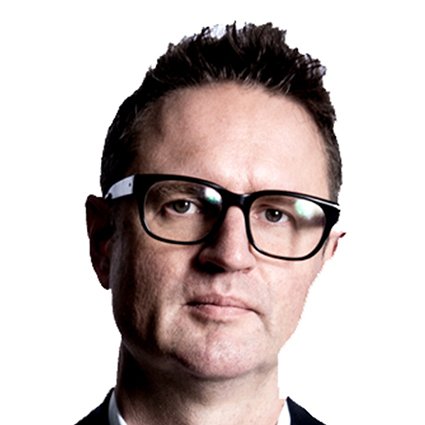 "Anyone running a large agency needs to be asking ‘how do I foster as much chaos as possible?’ because chaos will breed creativity, not processes and traffic systems," Murphy says. They say they do want to be a strategic partner to their clients, not a project-led shop; they want to help businesses reset the direction of their brands, not just do execution; they want to take a big, powerful creative idea across the customer journey. Spotting the opportunity is one thing, but you also must really, really need – right to your bones – to want to grasp it if you’re going to make good on that opportunity. Don’t you need to be scared shitless that you might not be able to pay the mortgage, feed your family, scared that people will think you can’t hack it, that you’ll let your proud mum down? Don’t new businesses need real jeopardy? Adam & Eve had jeopardy in spades: the founders sacrificed big jobs and meaty salaries and all the comforts of a big agency to launch it. And if taking a pay cut, living off packed lunches and using the local café as an office wasn’t thrillingly uncomfortable, the £750,000 Sorrell legal battle was. Golding says they have fear, and fear is jeopardy: "The fear is can we do this? Will it be good? Will people like it? Will there be a story? Will we look back in 10 years time and say the third act was absolutely brilliant? The first act, Rainey Kelly, was great. Adam & Eve has been successful beyond our wildest dreams but the third, how will that go? That’s the scary part. My children are not going to be in penury. But at the same time, will I look back and go ‘it’s been three amazing eras’?" "We’re driven by ambition," Golding explains. "So what’s the most ambitious thing we could do? We can stay at Adam & Eve and keep it as brilliant as it is: that’s reasonably ambitious. We could do a European role within DDB: reasonably ambitious. Or we can start all over again. That’s the most ambitious thing that we could do. So let’s do that." Ambitious for what, though, David? Don’t need money. Don’t need fame. Don’t need no credit card to ride this train. Ah, it’s the power of love. "I’m ambitious for us to create an organisation that we absolutely love being part of and the world loves that it exists. We want to do something that people notice and think ‘that’s magnificent’. And we want to be part of creating a sense that the ad industry is still alive, exciting and creating culture." Yep, they know that last one’s going to ring my bells. But they seem genuinely clear that their next act should have a positive effect on industry confidence and optimism. Murphy says: "It’s enormously important to us to do something that ignites the industry and inspires others to give it a try. There’s so many people in the industry who are criticising it and defining their modus operandi as being against the industry. But this industry, at its best, is absolutely phenomenal. Let’s all get it back to its best. It’s not that hard. And when it’s done, it lights up the world and can change lives and change businesses." It’s changed their lives, of course. But they wear their success lightly. The wealth that’s come with it has – so far at least – made little noticeable difference. "It’s never been about the money; the money’s not the thing," Golding insists. Surprisingly amusing, with a laconic, stiletto wit, Golding is excellent company. With his wife Sarah, the ever-impressive CEO of The & Partnership and current president of the IPA, Golding is part of a well-connected and heeled social circle. But aside from glitzy holidays, the Goldings are not highlifers, insisting they prefer nights box-setting on the sofa in pyjamas to clubbing in Mayfair. And Murphy, whose wife Victoria is an agency TV producer, has even fewer obvious trappings of wealth and success. You’ll find him at many of those dry industry functions that draw people with no better place to be, refuge of the not-quite-made-its. And you’ll often find he’s one of the last to leave. Whether that’s because he’s the supreme account man or simply loves the ad scene is hard to fathom but many times I’ve looked round a late-night pub full of drunken advertising journos or dandruffy, industry-committee types and Murphy is there, dug in. It’s remarkable, endearing even. Both are marvellously passive aggressive when under fire, witheringly critical of rivals and as ruthlessly competitive as two fundamentally decent, likeable people can get. In many ways they’re dully normal, and, frankly, a big disappointment if you’re looking for the glamorous stereotype of the Mad Men ad men. They’re the uncool kids from school who looked on bewildered while the jocks got all the attention. Even now, there’s something of the wary outsider about them. But they’re smarter, shrewder, less wearily cynical and a damn sight more engaged and passionate about the business of advertising than many, many you’ll meet in the industry. And though this article is very much about two standout individuals – and perhaps because they never were "the jock" – they worship the power of the collective, the importance of collaborative teamwork, the joy of group problem-solving. Murphy explains: "One of the healthiest things that’s happened in our industry is the move away from the idea of the guru, the frequently older, male leader in the corner office who has all the answers. The culture we’ve tried to encourage at Adam & Eve is one of disrespect. We’re not interested in hierarchy. The truth is that David and I have a great track record in listening. Don’t look to us to be the people that come up with the idea. But what we can do is we can sit in a circle, sometimes in the middle of the night when we’re trying to crack something. And we know how to listen. "In the last 10 years there’s definitely been some dark and challenging moments and we’ve really relied on the people around us and the things that they bring. And those people aren’t necessarily senior, they’re not the most experienced. They’re just up for it and willing. And that’s probably been the biggest lesson and that’s also the exciting thing about the idea of starting with a new collective." Their new tribe, whoever they end up being, will have a lot to live up to. In return, they’ll be offered the chance to work with two people who know how you do it right and are determined to enjoy the ride. "In many ways, Adam & Eve is the most incredible thing we’ve ever done but it’s not always been the most enjoyable thing we’ve ever done," Golding admits. "Because it had a bumpy start, the pressure was always on, the spotlight was always on. Whereas second time around we can really go for it. We can enjoy ourselves. This is possibly our final act, so let’s make it absolutely brilliant. Let’s have a total laugh." What were your first impressions of David? What’s David’s best strength as a business partner? He always has a good idea. In what ways do you think you complement each other? What really irritates you about David? He’s addicted to hard-boiled eggs. He’ll turn up for a crucial client meeting, sit down, produce a hard-boiled egg, unsheath it and eat it just as the CEO/ CMO enters the room – it puts me on edge. What do you really love about David and why? He’s surprisingly very funny. His bottomless reserves of gallows humour have been essential. What’s your fondest memory (so far) of working together? He always says "we might be able to save this if we make the grade better"… when he’s looking at an entirely finished online edit that’s brilliant. What’s the best piece of work you think you’ve done together (so far) and why? He’ll say "Always a woman", so I’ll say "The long wait". What were your first impressions of James? James had a curtain haircut, difficult glasses and an obsession with Norfolk. I knew it wouldn’t last. What’s James’ best strength as a business partner? James is naively optimistic. He cannot understand what can’t be done. And so, we normally end up just doing it. And often it somehow works. James grins, I frown. Good balance. What really irritates you about James? He steals food from your desk, even if you haven’t even started on it. Stealing crisps from an open bag is one thing, but opening the bag to steal the crisps is unforgiveable. What do you really love about James and why? No matter how bleak the situation, whenever James walks into a room you know things will be OK. It’s a weird skill that very few people have. There are very few, but probably working through the night on the Camelot pitch fuelled by laughter and Wall’s Viennetta. The agency and us at our best. "Always a woman". It’s the ad that changed everything. The business is oxygen to James and David; they love it. They’re both incredibly driven, they love the game, the competition, the clients. The business is in their blood, it’s a bug. Once we did one good piece of work, they became like crack addicts. They were high on the feeling it gave them, and away we went. They’ve always worked like absolute dogs on pitches and have developed a real addiction to making great work happen. I think they think: "We can do this better than quite a lot of people so why wouldn’t we keep doing it?" All three of us felt we had something to prove. Whatever stage we were at, we never felt established, we always felt a bit on the outside of the industry, which gives you a really good energy. James and David lead by example – there isn’t a lot of pontificating or self-indulgent speeches, they just get on with it and do great work. We worked incredibly close together, with our seats pulled up next to each other. We were all there with our sleeves rolled up sitting over the work. And we had massive rows about it – all the time. And particularly in the early days when we were trying to find our voice and we fumbled and flailed around. David is a brilliant planner with creative work, he’s an incredibly good judge of creative. He isn’t some sort of overly intellectual planner who disappears off into a corner and loses his connection with the work and real people – he’s right in there with you. James is the same, he’s always on it. If I were going to do another start-up I’d only ever do it with James and David. But I’m not.